I can identify with the tea stash, although mine isn't as big as yours. 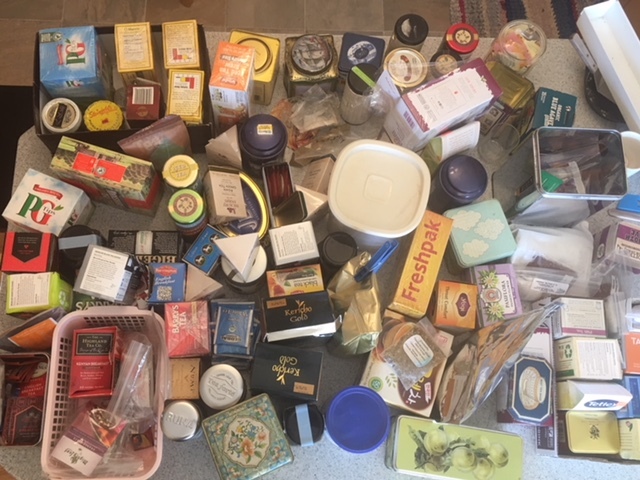 Recently (while getting ready to move) I was evaluating and sorting tea bags. I was amazed at the variety and quantity of tea I found. There's nothing like moving to make you weed out and cut back. Hope the process goes well for you. Dorcas, I am working home full time now as a writer and speaker. My other work in these days is counseling, so when I'm not by myself I'm with people who may or may not be healthy. You can imagine. God answered my prayers by allowing me to work from home, for which I'm thankful after 15 years of working outside the home. The home has such a place in my heart and as the nest empties I do believe that our homes are also the places where significant ministry happens. Thank you for reminding us of the value of home. Bless you and I agree that there is a transition to ministry as the nest empties. I love being at home now. When we lived in CA, I didn't like being home because, well honestly because it was a mess. Now in our new home, I enjoy staying home where I can get some sewing lessons done. I can create more yummy recipes and crochet fun projects. I can actually get cleaning done if I'm at home and not running from this place to that place. I feel more like a Keeper at Home. Interesting. I think it can be a vicious cycle--if things get chaotic at home it's tempting to stay away, which makes things get worse at home, and so on. I'm glad you're feeling more settled. I think that book "The Lifechanging Magic of Staying at Home" is sorely needed! When we stay home and establish routines our homes become havens and sanctuaries rather than depots. Thanks for sharing your thoughts and wisdom. I like that word--"sanctuaries." I really want "home" to be a welcoming, peaceful place. I love this post on pretty much every level. But I have no idea what the quote of the day means. I will have to consult Google. I have a huge tea stash, maybe like 1/3 what you have. I laughed out loud when I saw the tea picture! My family teases me about all the kinds of tea I have...but when you drink several cups a day, its nice to have a selection! Yes, staying at home is therapuetic! I would love to share some of my tea with you! Well, our friends Dave & Carol just moved there, so maybe....some day! I loved and related to almost everything in this post. I, too, now love staying home since we moved to a smaller house and the nest is empty. It is actually clean and uncluttered most of the time! The concept of the home as sanctuary is very prominent in Judaism and the woman is the "akeres habayis", the mainstay who brings holiness to the home. I laughed out loud at the "happy little Mennonite-lady dance". Just last week I did a goofy little happy-dance because it's parent-teacher conferences in the schools and I don't have to go to them ever again! Also the lovely little girl dress you made is almost the same as the blue gingham dress that all 3 of my girls had their portraits taken in when they were 18 months old. I don't have as much tea as you, yet. I love that "akeres habayis" idea! Judge?! I rather envy that stash! I'd like to try some of it. I only have about4 different kinds. Good post. I enjoy home too esp when my children and I can mess up the kitchen. But then I'm ready for a break again. I love a good black tea in the morning, an Earl Grey in the afternoon, and a rooibos at night. Plus lots of others for variety. Bless you for cleaning out closets at this stage of your life, and for feeding and blessing others as well! 1. First, several killer lines in this post: "I've found that you can read all about downsizing and efficiency, but the key ingredient that is often missing for me is staying at home to do it." And "'Don't judge,' as worldly people like to say when they know they are being ridiculous." I almost woke the son on my lap, laughing. 2. What you love, you really love. Fabric. Tea. I like that about you. 3. Although yes, in an entirely non-judgemental way: that is a LOT of tea. I think you should share some immediately. 4. I know you have history with your unusual name "Dorcas," for good or ill, but today for the first time I connected you with your Biblical namesake, and wondered if that is a legacy that your mother, or Jesus, intentionally gave you to share. Today it was that enchanting little girl's dress that made me think of it, sewed because you wanted to do it and because someone you know will benefit from it. Who does that?? I love that you sew for others, and for love, and for joy. Oh Shari, you say the most kind and encouraging things, always. You know, sewing was one of the hardest skills for me to learn, and my name seemed like a bad joke. But when I learned to sew, I really GOT IT, and have lived up to my name ever since. I see it as one more example of Redemption. Such a beautiful post. Thank you for sharing your heart and encouraging others as well. It is such a good feeling to organize the stash of items that accumulate. I'm grateful we could visit at your church this past Sunday and thank you for blessing us with a meal when I'm sure you had other things to tend to. It was so refreshing!!! May God bless you this week as you serve Him by reaching out to others who need a listening ear. It was great to have you here and to meet your family. The dinner was very low-stress! Did I mention I also have a huge stasb of tea too! I love drinking tea and maybe I'll post a picture of my tea or my blog. I'd love to see your stash. Thanks! Just guessing you know more about didgeridoos than I do, so you can actually picture this. Are you aware your new post is not on your blog the American Cultural Divide ? Yes. Someone found it offensive and ....well, long story...but i took it down for now. Dorcas, you have a 2nd blog? I love tea, hot or iced. The only familiar tea I see there is the PG Tips and the Yorkshire tea. I like those, black, with a sandwich at lunch.